It may not be remembered as one of the great movies of 2016 but The Legend of Tarzan is pure, popcorn munching entertainment. From its powerful soundtrack, it’s breathtaking scenery, and some notable performances from the main cast, I thoroughly enjoyed this movie and if you are a lover of adventure and romance, you will too. The start of the movie was bogged down a bit with some political backstory surrounding the colonial powers that governed the Congo in the late 1800s, but the central story sees an older Tarzan (Alexander Skarsgard), now John Clayton III Lord of Greystoke, eight years removed from his time in the jungle. 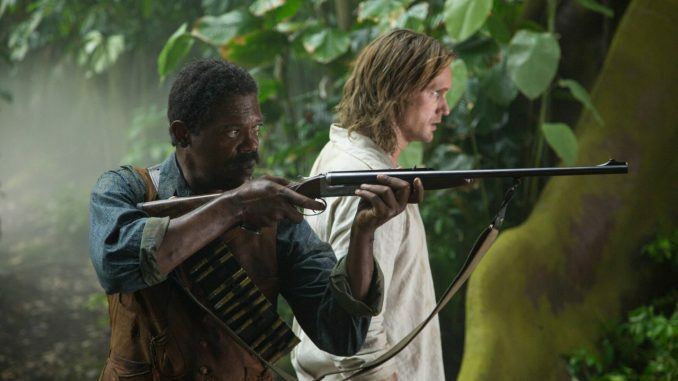 As a man who knows the jungle well, he is called on to return to the Congo as a trade emissary of British Parliament and brings along his wife Jane (Margot Robbie) and an american representative, George Washington Williams (Samuel L Jackson). Unfortunately, Tarzan is being used in a vicious and greedy plot masterminded by the Belgian Captain Leon Rom (Christoph Waltz). Skarsgard does well portraying a man juggling the wildness in him and the life of a normal adult. We are treated to bits and pieces of not only what happened when he was young, but of his meeting of Jane and the natives that would ultimately teach him what it is to be man. His ferocity during fights is amazing and his compassion and love during both romantic encounters with his wife and the animals that he loves comes through in spades. There is often a worry with films that center around a character like this to settle for an actor that looks the part and allow the supporting cast to cover but in this case, Skarsgard leads the movie well. Speaking of supporting cast, both Robbie and Jackson brought great performances as well. Margot Robbie brought a fierceness to Jane that most people would not have expected. While the majority of the film she does spend captured as bait for Tarzan, you never feel like she is just a damsel in distress, cowering and waiting for her man to save her. Samuel L Jackson plays a much different roll bringing levity to some of the crazier things and serving as a perfect companion to the titular character. The only person I truly had an issue with was Christoph Waltz who, by all accounts is a terrific actor, you constantly feel is being underused. This seems to be a trend in the past couple of movies where we received such a dark and compelling villain in Waltz from Inglorious Basterds that everything in comparison feels like the writers think by just having him on screen is enough to create a villain and they don’t spend a lot of time developing his character. In any case, I thought this movie was wonderful. A great blend of action and story with a hero that we love and can feel good about cheering him along. Every movie can’t be the best and there are surely flaws that I am overlooking (cough CGI animals cough) but that can make a good movie too. As long as you walk out of the theater feeling like you have been entertained, I believe you must conclude that the experience was good. It may get lost in the 2016 season with blockbuster after blockbuster rolling out every week but I think it is well worth your time to check this movie out.